I had this pillow sham in my "stash" for awhile now. I really loved the colors and patchwork details that went into it. It was torn down one of the seams so I added the black trim in the middle. I couldn't really find a place for it in my home though. I also have a house of boys, and well, pretty pillows kind of get used as hand wipes and objects to be thrown rather than accents if you know what I mean. Initially I thought it would be a cute bag...which it totally would, but I have plenty of those. It had the perfect measurement for a mini skirt front but the back was separated in 2 parts to insert a pillow. 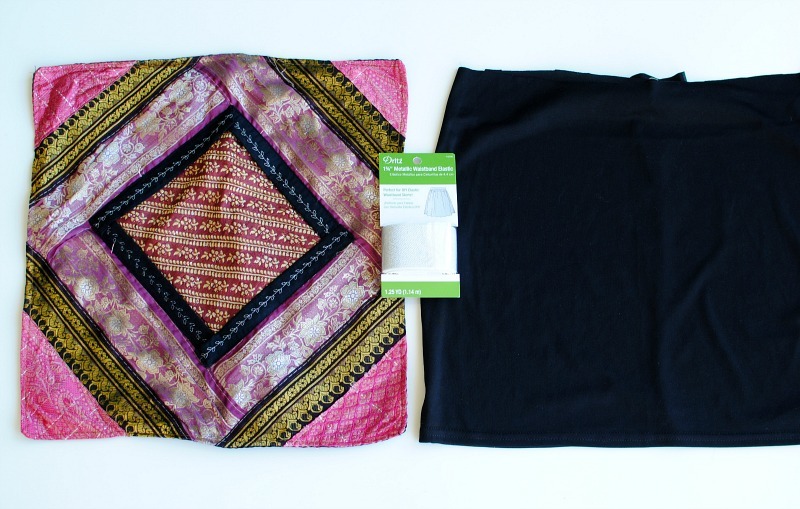 It happened to be next to another garment that needed an update: a basic skirt. Don't your textiles sometimes tell you what they should be? So I decided let's start with this! Plus it's another chance for me to test out Coats Eloflex Thread which I've really been loving lately. 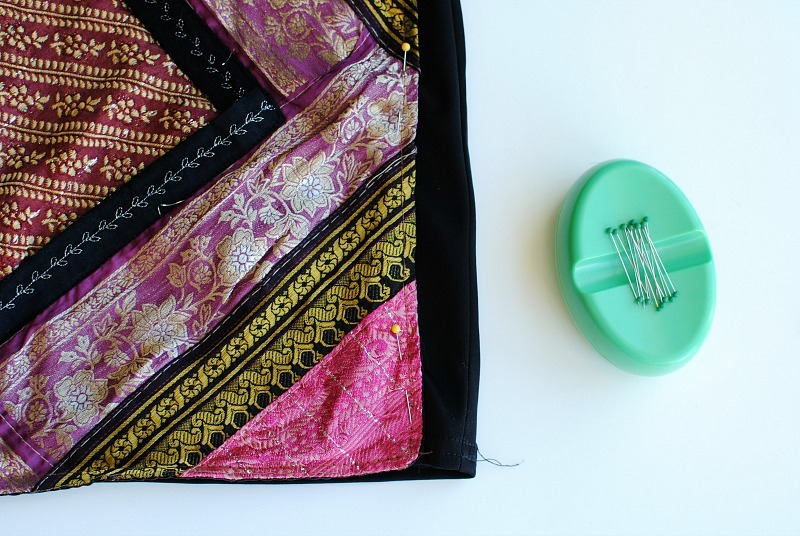 Eloflex is a stretchable thread that you use for both hems and seams. It won't pop when stretched because it expands with the fabric. It's great for elastic waistbands like this as well as knits, athleisure, swim suits, and more. 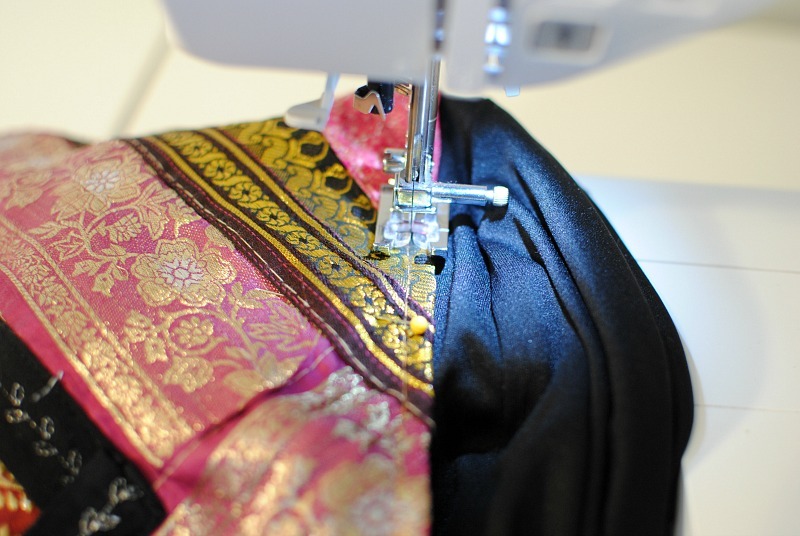 Get the details below and make your on front panel skirt. Pillow sham/fabric: you can use any type of fabric to create a front panel. 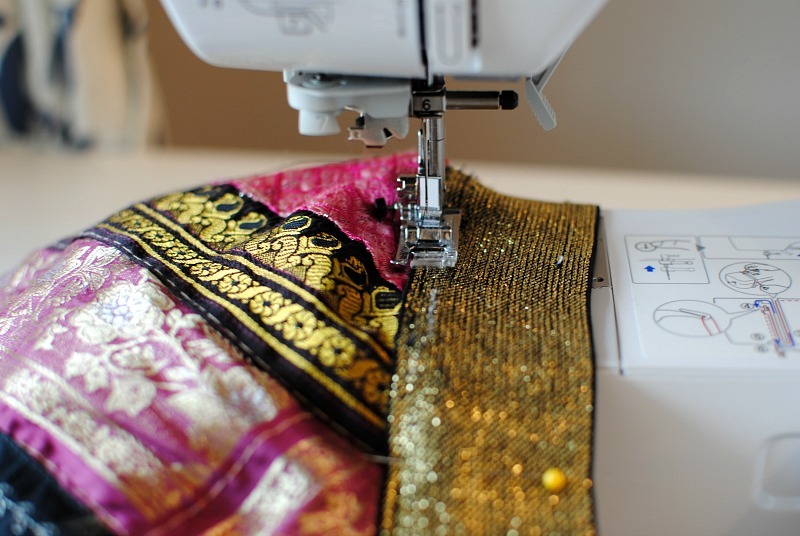 DIY Instructions: Remove the pillow sham back if necessary by unpicking the stitches with a seam ripper. Then press to keep the seam allowance edges folded under. You now have your "front panel." Again you can simply use fabric for this as well. If you do use fabric, press over the side and bottom edges towards the wrong side of the fabric 1/4" or so. Make sure the front panel fits the length of your skirt. I trimmed the skirt at the top to fit the length of the pillow sham (if you're using fabric you can trim the fabric to match the skirt length). That way I could keep the natural hem of the skirt since we will be adding an elastic band at the waist anyways. 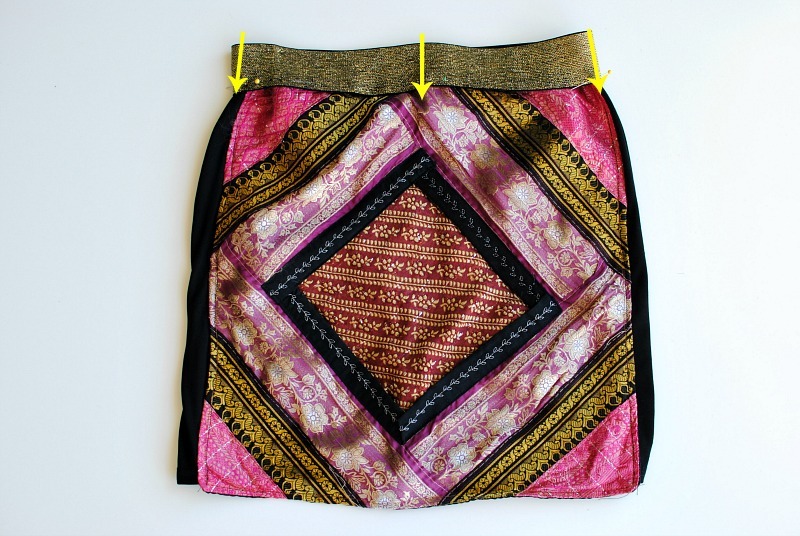 Pin the panel onto the front of the skirt. Top stitch the panel on the skirt front. Make sure to not accidentally sew the back in there. Use your free arm if necessary. For the waistband: These Metallic Elastic Waistbands are perfect for when you want a dramatic waistline. No need to create a casing for the elastic! Cut the elastic to equal your waist measurement. I didn't include a seam allowance because I want it to fit snug around my waist. Use Coat's Eloflex stretchable thread that will stretch with the waistband without tearing. Fold so right sides are together and sew 1/4" seam allowance. Lay the seam allowances flat and edge stitch them down. 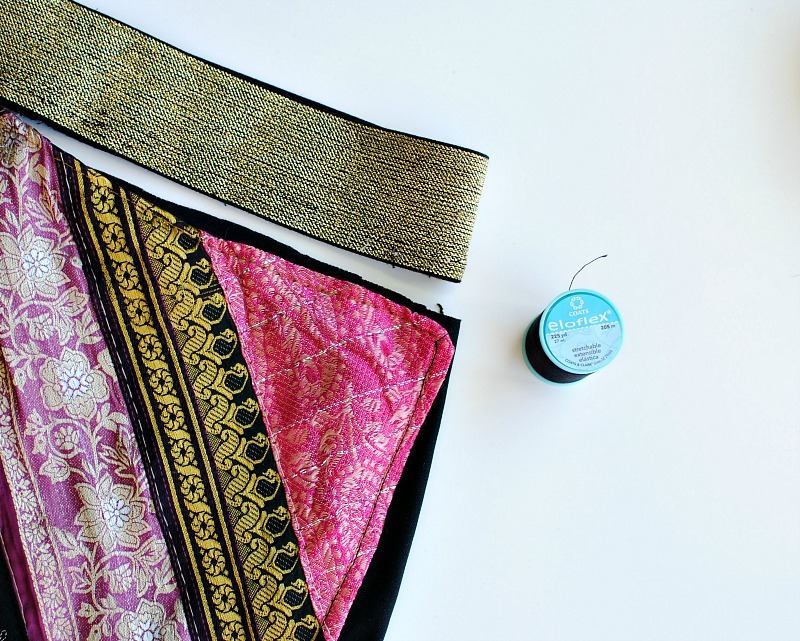 Pin the elastic waistband onto the skirt: You will want to get the quarter measurements of both the waistband and skirt (side seams for skirt). Mark them with pins. Pin the sides together and mid points. The skirt will be slightly larger that is why it will be important to match the points. 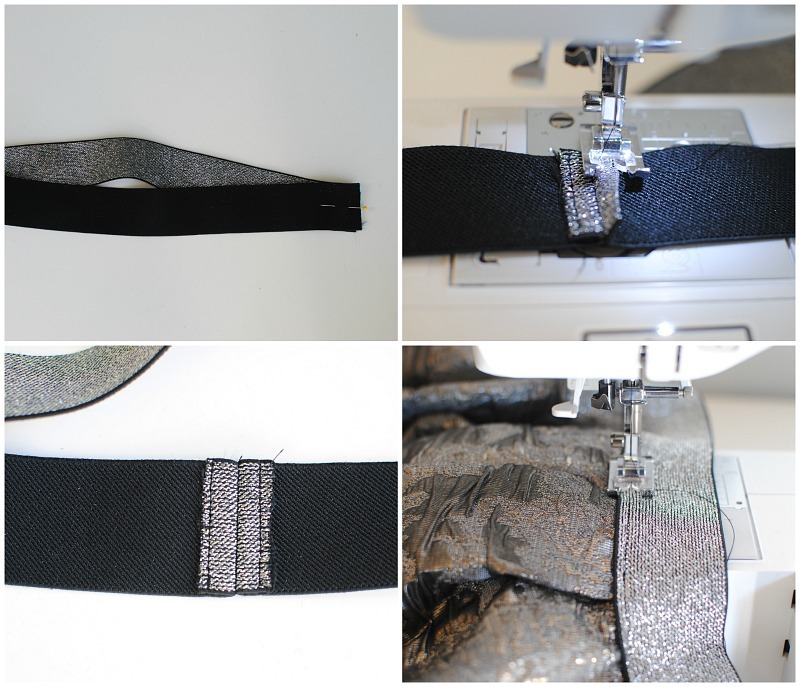 As you sew the waist band on you will slightly pull the elastic so it fits at each point. 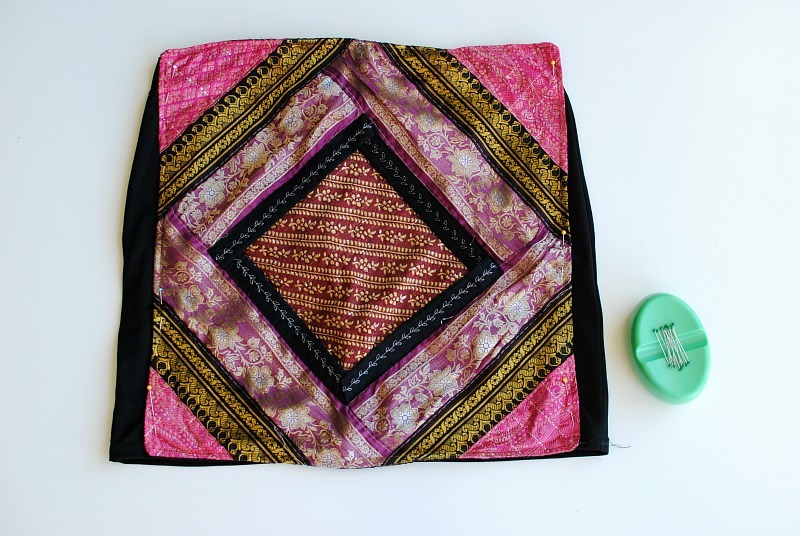 What I love about Eloflex thread is you don't have to do a zig zag stitch which is typically used when sewing with stretchy materials of any kind. I used a straight stitch (3.0) which creates a nice top stitch. Try the skirt on and you don't hear that dreaded POP sound when stretching over the hips! Success. I'm going to be using this thread on some sportswear coming soon, so stay tuned. I love this skirt. Such a great stand alone piece with a classic blouse. Can you see the funny looks I get when I get asked where I got the skirt from? An unwanted pillow sham :). I regularly visit your site and find a lot of interesting posts. I like your clothes. You've really made my day today with this post. You are a great artist and i admire your work a lot. If you are looking for embroidered polo shirt,then you can contact bludog for further details. Now days many want to make a build muscle but they have lack of knowledge So for proper guidance please read my article. Your article is very awesome and with good knowledge. Our store is the best supplement store in Amritsar here you will find all types of bodybuilding supplement in cheap rate so don’t hesitate during purchasing any product.